The snow doesn't give a soft white damn whom it touches. There is no snow on the ground as I write this. In fact, it's been teetering between rain and freezing rain all morning. 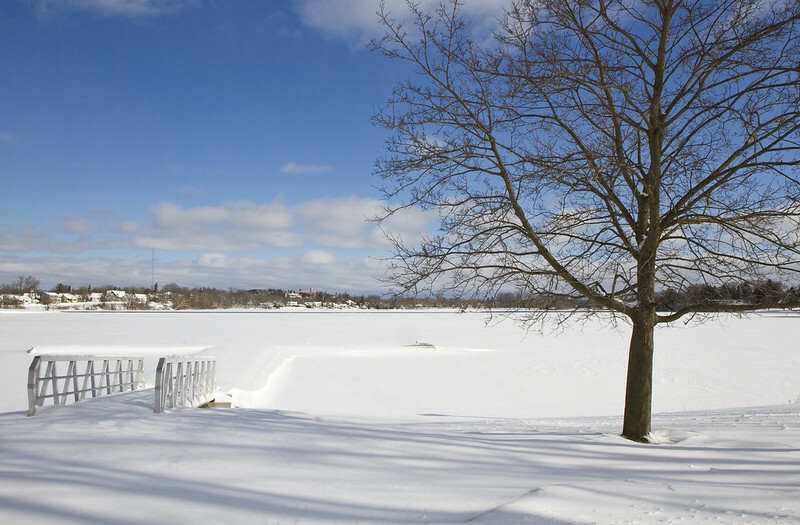 The following images were taken after February's big snowfall. Hopefully it was the last big one. 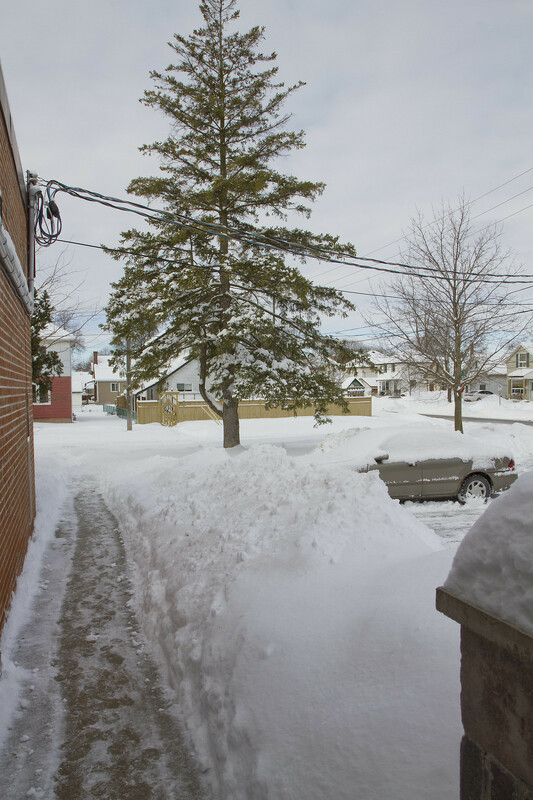 Stepping outside of my apartment, I can see that the parking lot and walkway have been shoveled. Not all of the roads and sidewalks were as clear though. Let's head out to the lake. If those slingshot chairs, aptly named The Launch Pad were real, they might just be powerful enough to send you out into the open water. 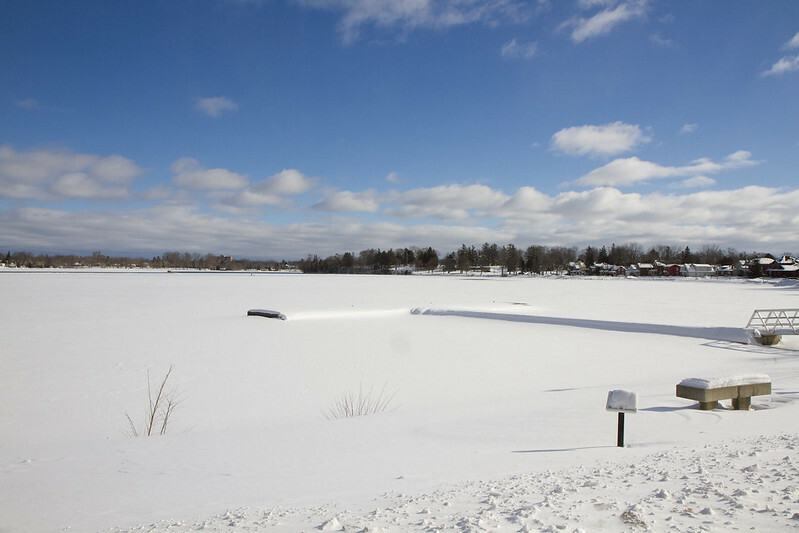 A fresh snowfall makes it difficult to discern where the land ends and the lake begins. The tree does grow rather close to the water. This walkway leads onto a large T-shaped dock. It's mostly covered in snow but you can still make out the outline. You can see it a lot better from this angle. Just a few months ago, these guys were having the time of their lives fetching tennis balls thrown from the pier, into the water. This was as far as I could get around the lake. The snow was too deep to traverse beyond this point. In a different direction, this guy was accepting his fate of trudging through the snow. He had several metres of frozen hose behind him, too. 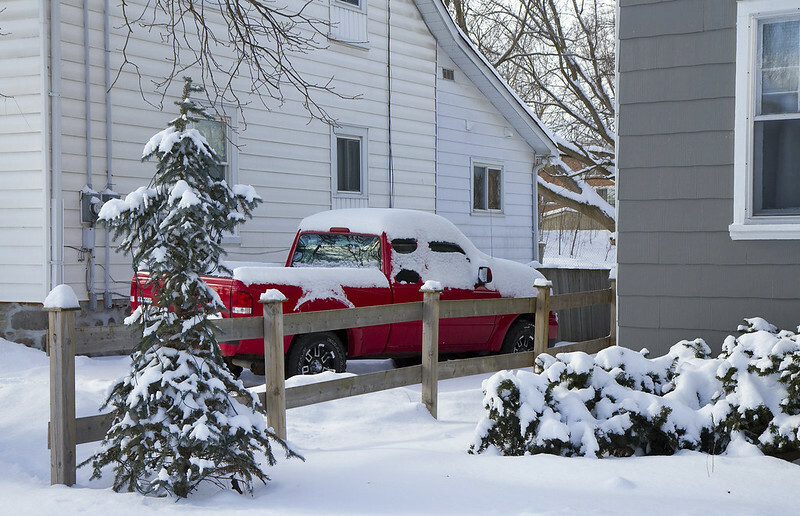 Heading back toward home, this bright red truck amid all of the snowy white caught my eye. 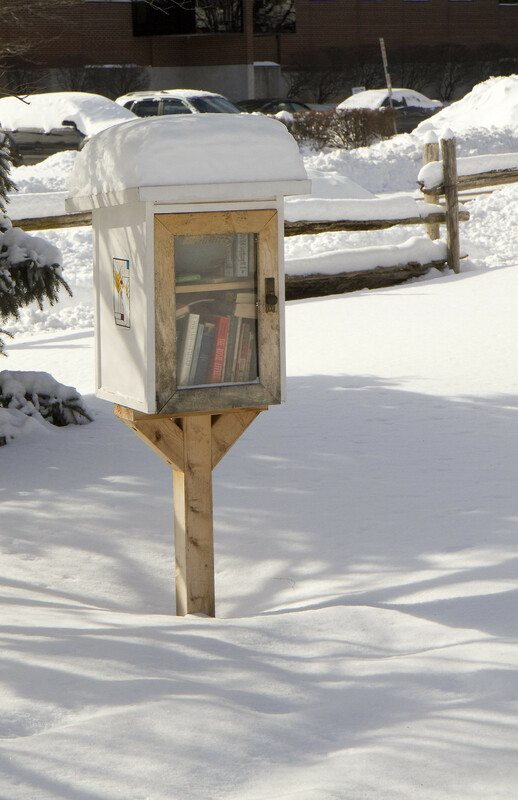 The Little Library was wearing its snowcap. Nobody had visited since the recent storm. 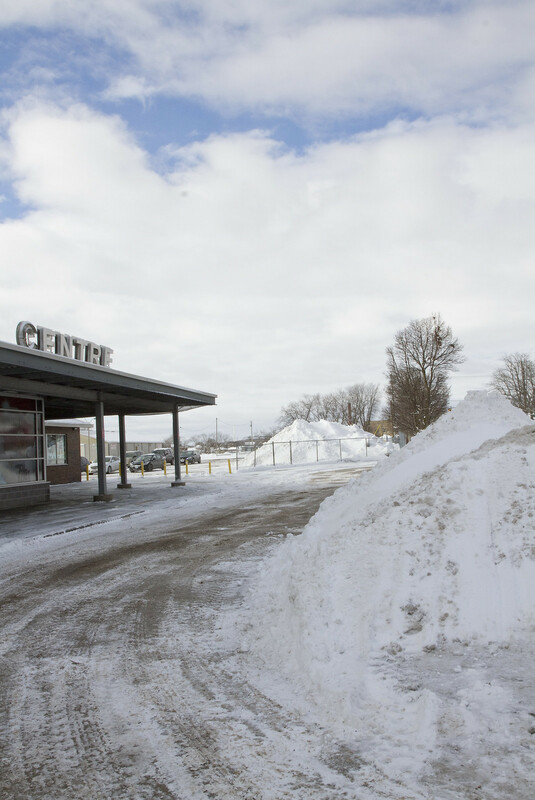 This is the parking lot at the Peterborough Memorial Centre. It took a long time for those piles to melt. I do believe they're completely gone by now - more than a month after the snowfall. 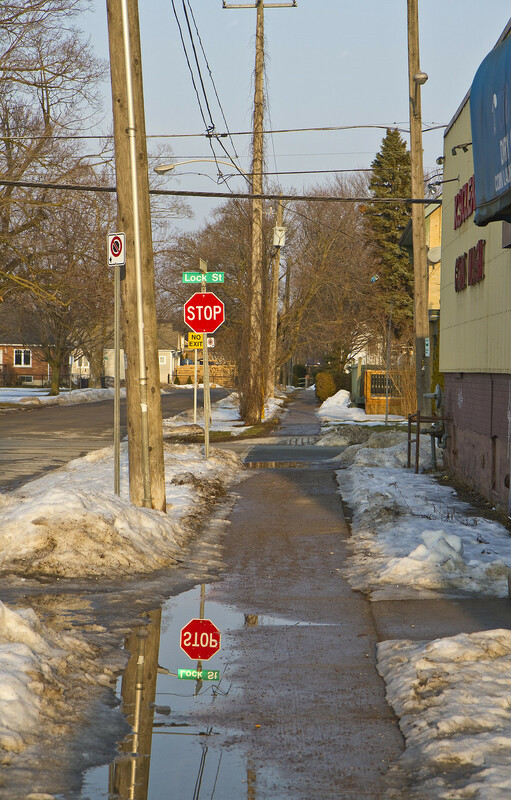 A few days later, warming temperatures made for a quick melt. Bright, late afternoon sunshine made for saturated hues. And puddles offered some colourful reflections. Walking into the lowering sun made for golden light. The road that leads to home - where Netflix awaits. 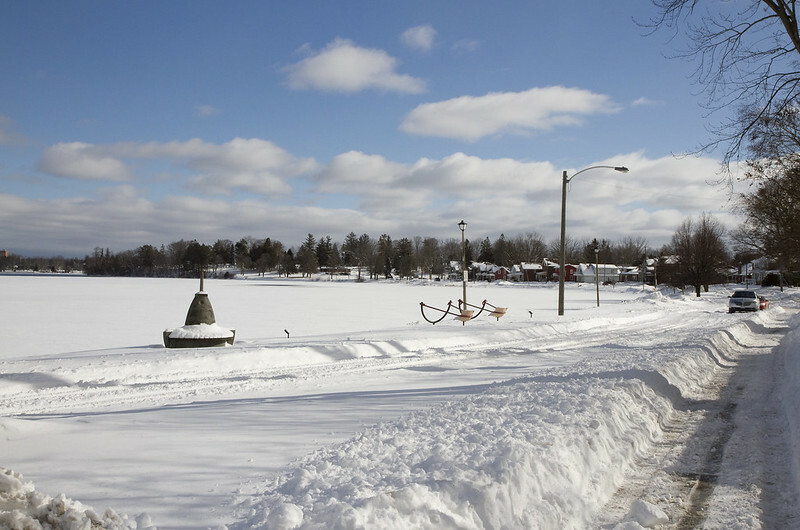 One thing is for sure... Peterborough got much more snow than southern balmy Pickering. We had so much snow here and I'm so glad it's gone. Pretty to look at, Ugly to shovel. To me, the stature represents Canada, going about life all year long, regardless of the weather. Beautiful photos. We have not reached the melting stage yet from the blizzard last week. Beautiful shots. The sculpture of the fire fighter intrigues me. We still have snow on the ground, having had gotten a fresh pile in recent days. Snow should hire you as press age t! 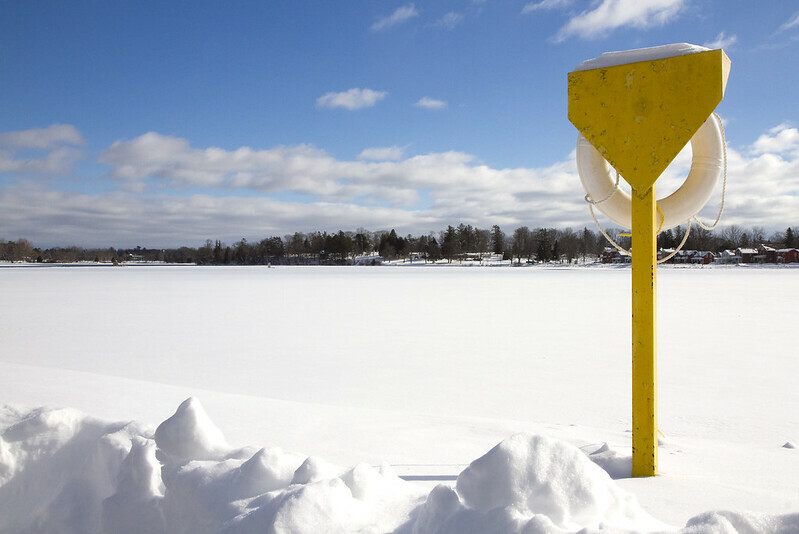 You really got clobbered by the snow, although it does make for great photographs. Winter is leaving...soon! Goodbye. I say that as I have bravely moved my citrus trees to the deck and am hoping temps stay above 45F. I love the fireman with the snow on his head. He looks almost real! Did you get the freezing rain? We only had a bit of rain. No freezing involved. That photo of the firefighter statue is AMAZING!!!! Everything looks so fresh and white after a storm. Love that little free library, we saw some when visiting BC and would love to find some around here. We got ice rain followed by rain this morning. Spring weather is coming ... isn't it? You did have a very heavy snowfall. New snow that covers everything gives you a good opportunity for a photo challenge. Melting spoils all the beauty of the new snow. Snow creates such lovely scenes. I like the lake shots,especially. 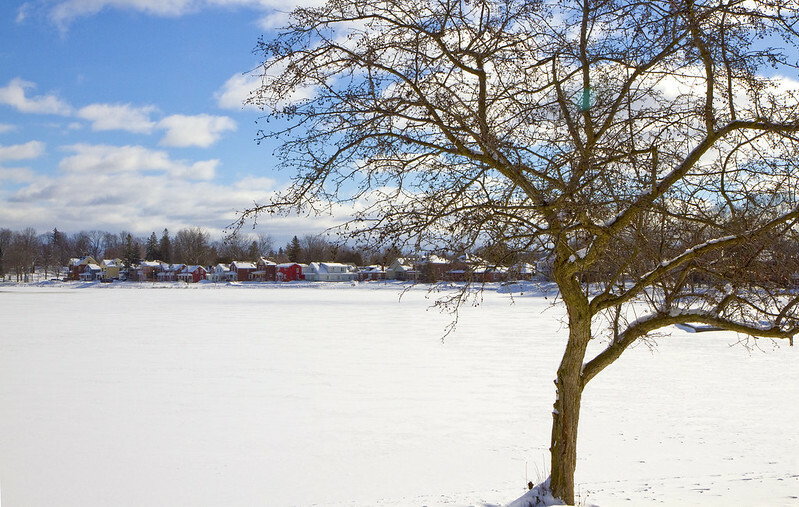 Thanks for sharing some snow scenes. 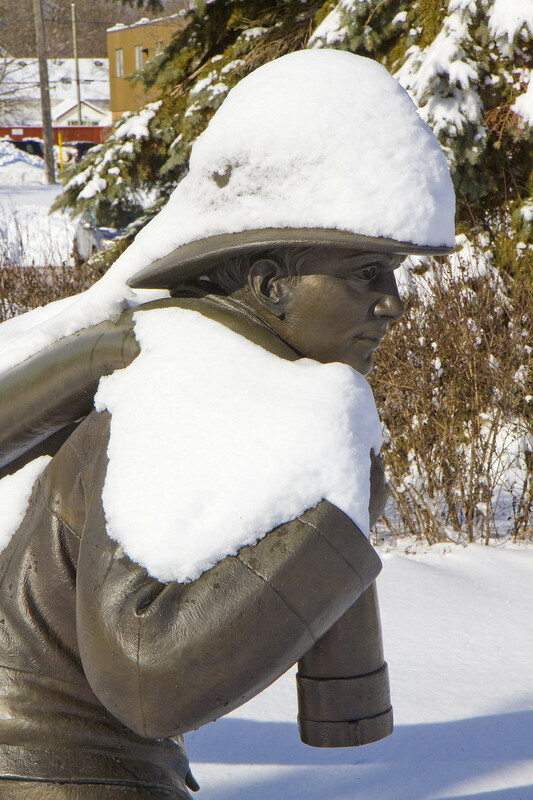 I love the fireman statue in the snow! Goodness- that's a lot of snow. Ii hope it is melting fast. Snow changes a landscape so much, it always surprises this south Louisiana resident. If i moved to where there was a lot of it, it would take a long time to get used to it. Thank you for taking us on your snowy walk. I love a pristine snowscape. 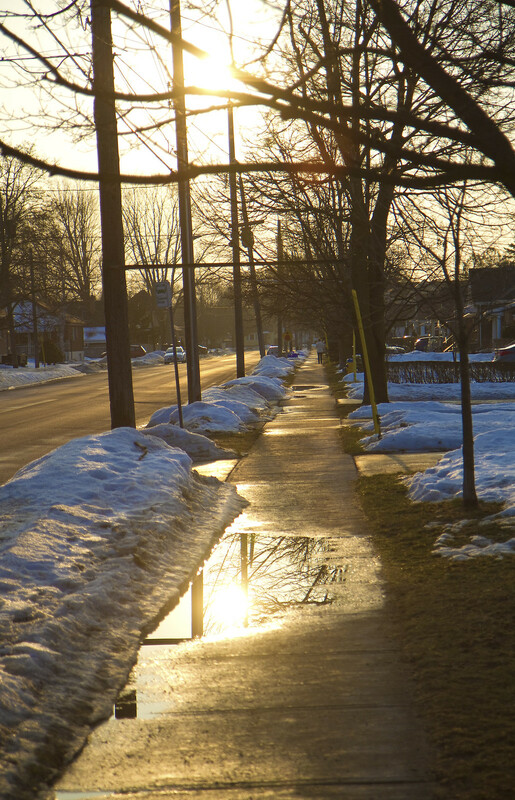 lovely snow .. great light in the melt photos ..
Ah, the lovely fluffy white stuff that I only experience from a distance. I get to enjoy your beautiful images--you do all the shivering for me. What is the memorial Center for? Lovely stuff...thank you. I so hope you are doing better. just the way I like to see snow...in pictures. Well we got dumped on today - April 1st of all days! Nice to know that your snow is all gone. Spring certainly is coming - just very slowly. LOL. I love the pics of sun reflecting in the puddles and I think your frozen fireman was a real hit with everyone! He does look authentic somehow. I mean alive! Hope you are well and anticipating spring flowers soon. We hardly ever get snow! Looks good on postcards and photos, I always say! We have a little library like that one you took a picture of, near us. Great idea. Lovely snow shots! Spring has to work hard! Came back here to check and realized your spelling of damn. Oh, a swear word!! Tsk Tsk. The burden on that statue is even heavier with all that snow. I bet spring has sprung by now! That poor bronze firefighter with his snow-laden hose. Wonderful images, as always, Cuz. Can't say I miss the snow, though. 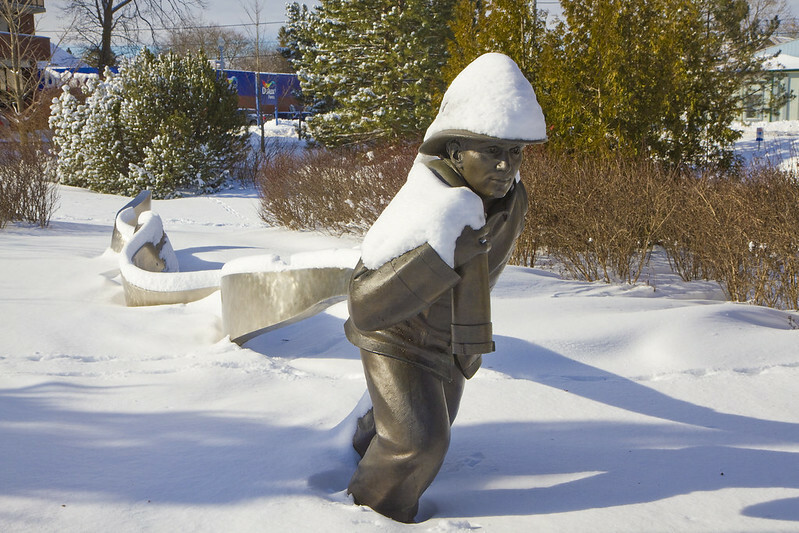 Love the fireman statue in the snow! And the final picture is delightful with that golden light! BRRRR! But beautiful! When it snows here (which it rarely does, as you know! ), I can't wait to get outside with my camera and enjoy the peace and quiet of it. And that's only with a few inches at best. 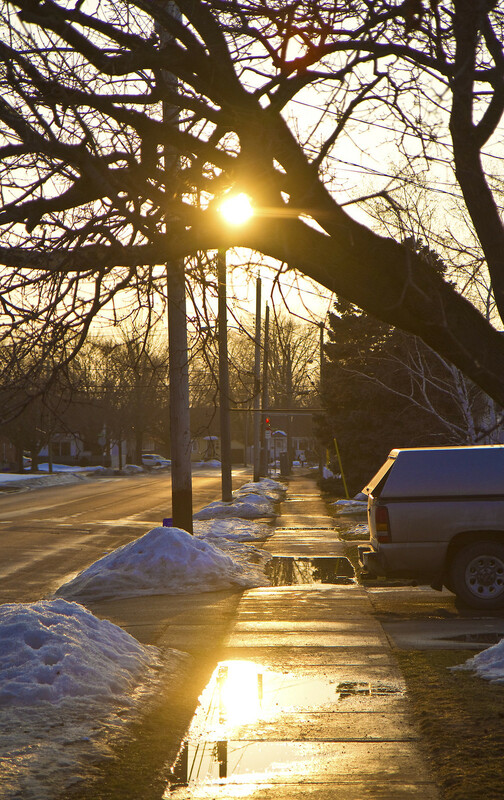 These are beautiful shots, especially the golden sunshine in the last ones.